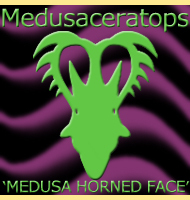 Name: Anchiceratops ‭(‬Near horned face‭)‬. Named By: Barnum Brown‭ ‬-‭ ‬1914. 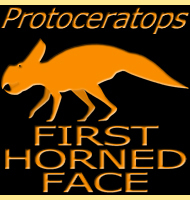 Classification: Chordata,‭ ‬Reptilia,‭ ‬Dionsauria,‭ ‬Ornithischia,‭ ‬Ceratopsia,‭ ‬Ceratopsidae,‭ ‬Chasmosaurinae. 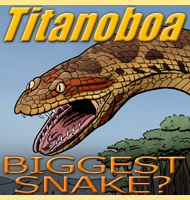 Size: At least just over 4 meters long, possibly up to 6‭ ‬meters long. Known locations: Canada,‭ ‬Alberta‭ ‬-‭ ‬Horseshoe Canyon Formation,‭ ‬Dinosaur Park Formation.‭ ‬USA,‭ ‬Wyoming Almond Formation. Time period: Campanian to early Maastrichtian of the Cretaceous. Fossil representation: Usually only the skull and skull fragments,‭ ‬some partial post cranial material including an almost complete spine has also been found. Studies of fossil sites where Anchiceratops remains have been found have revealed that Anchiceratops lived around estuaries.‭ ‬This may explain why Anchiceratopsremains are rare when compared to the remains of other ceratopsians known to live on open plains.‭ ‬As a chasmosaurine ceratopsian,‭ ‬Anchiceratops had a large neck frill surrounded with bony triangular projections,‭ ‬but moderate brow horns,‭ ‬and a reduced nasal horn.‭ ‬As in other ceratopsians,‭ ‬Anchiceratops is known mainly from skull material,‭ ‬although the spine and possibly other fragmentary skeletal material is known. There was once another species of Anchiceratops named A.‭ ‬longirostris which was based upon the fact that the snout is longer with horns that curve forwards as opposed to the upwards pointing horns of A.‭ ‬ornatus.‭ ‬Later study and comparison with other material has since revealed that these differences are not down to different species but different sexes.‭ ‬With this male Anchiceratops are thought to have longer brow horns that point upwards,‭ ‬while females have shorter brow horns that point forwards.‭ ‬Males also seem to have shorter snouts than the females and combined with their longer horns this is probably to make it easier for males to fight one another with their horns during dominance contests. 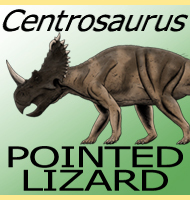 - Anchiceratops, a new genus of horned dinosaurs from the Edmonton Cretaceous of Alberta. 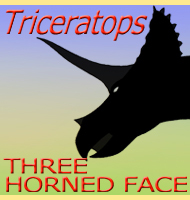 With discussion of the origin of the ceratopsian crest and the brain casts of Anchiceratops and Trachodon. - Bulletin of the American Museum of Natural History 33(33):539-548. - barnum Brown - 1914. 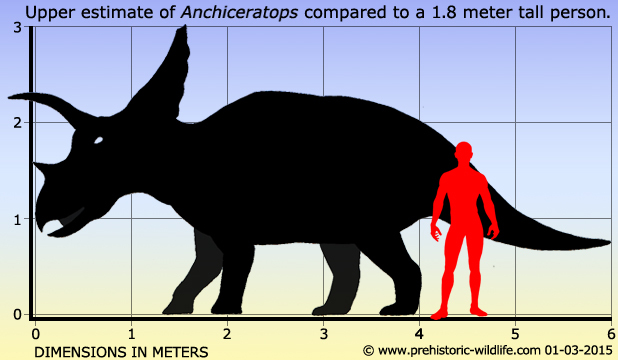 - Anchiceratops from the Oldman Formation of Alberta. - National Museum of Canada Natural History Papers, 3: 1-11. - W. J. Langston - 1959. 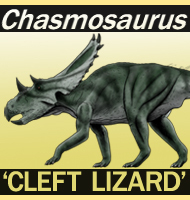 - Description of a complete and fully articulated chasmosaurine postcranium previously assigned to Anchiceratops (Dinosauria: Ceratopsia). 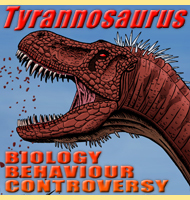 by J. C. Mallon & R. Holmes - In, New Perspectives on Horned Dinosaurs: The Royal Tyrrell Museum Ceratopsian Symposium. Indiana University Press, Bloomington, Indiana. pp 189–202 - M. J. Ryan B. J. Chinnery-Allgeier & D. A. Eberth (eds). - 2010. 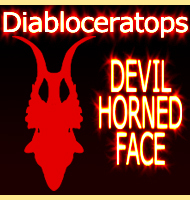 - Variation in the skull of Anchiceratops (Dinosauria, Ceratopsidae) from the Horseshoe Canyon Formation (Upper Cretaceous) of Alberta. - Journal of Vertebrate Paleontology, 31(5): 1047-1071. - Jordan C. Mallon, Robert Holmes, David A. Eberth, Michael J. Ryan & Jason S. Anderson - 2012.